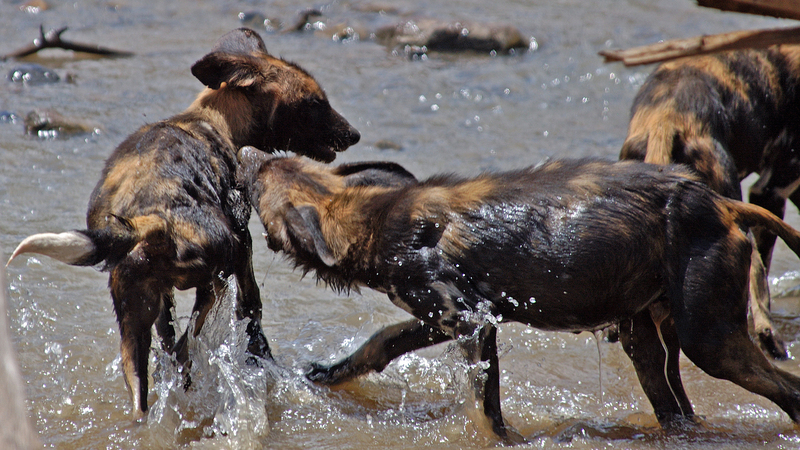 African wild dogs are among the most successful social hunters in Africa. They have dagger-like teeth, designed for eating meat, and when hunting prey, their bodies cool down after running as fast as 37 miles per hour (60 kph). African wild dogs are sometimes called painted dogs for the combination of black, tan, and white blotches across their bodies. Each animal has a distinct pattern, but all have black faces and ears, tan foreheads, and white-tipped tails. 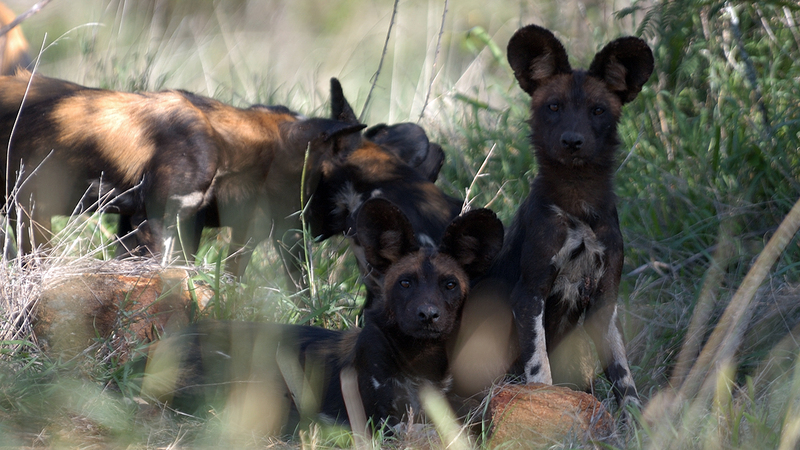 What is the average pack size of African wild dogs? African wild dogs typically hunt in packs of 7 to 15 dogs led by a dominant pair, but have been observed in packs of up to 40 animals. Before their recent population decline, packs could number up to 100. Packs are made up of relatives. All members help rear pups born to the dominant male and female. The packs, which average 9 to 10 adults plus juveniles, are extremely social. Both males and females leave the pack where they were born, but males tend to disperse a year after females and travel farther to new territories. Females in the pack are closely related to each other as are the males. However, males and females in the pack are not closely related to each other. 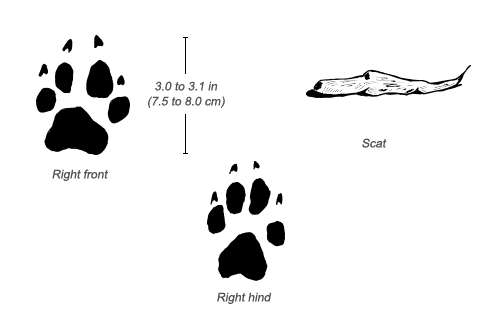 A pack’s average territory is about 234 square miles (606 km2), but varies based on how much prey lives in the area. African wild dogs aggressively defend their territory against unrelated neighbors and will fight intruders to the death. African wild dogs have a complex communication system that includes both vocalizing and scent marking. The dominant pair marks their territory with feces and urine. Members of a pack use quiet but high frequency sounds to communicate. Their whines, tweets, and yelps sound like birdcalls. The dominant pair howls to signal intruders or a nearby pack. They emit a hoo sound to gather their dispersed pack or to find a lost member. African wild dogs gather to hunt just before dawn. Individuals split from the pack and kill whatever they can, sometimes with help from another pack. They eat together, quickly and quietly, and share the food. A pack was once observed devouring a Thomson’s gazelle in 15 minutes! If pups are traveling with the pack, they get to eat first, but if they remain in the den, the adults will regurgitate meat when they return. African wild dogs sleep on top of each other and are not bothered by visiting animals—even potential prey—when they are sleeping. During the last few hours of daylight, the pack once again heads out to hunt. 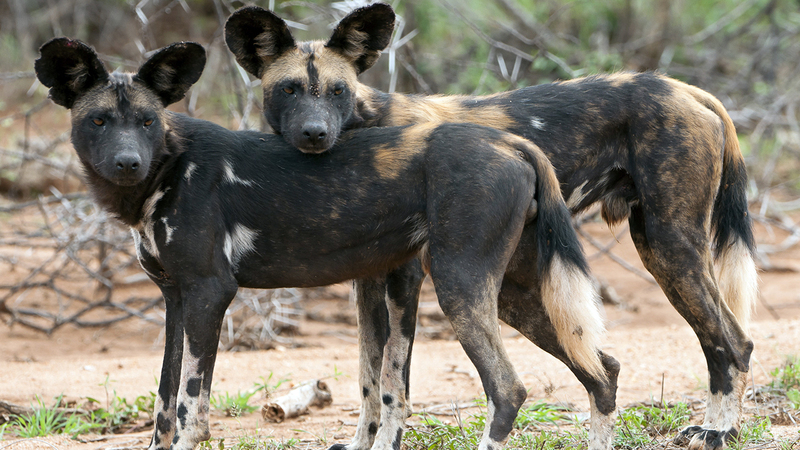 Human activities, prey shortages, and disease pose the biggest threats to African wild dogs. Historically, ranchers have viewed these animals as a threat to livestock, but researchers have found that they don’t kill nearly as much livestock as originally thought. 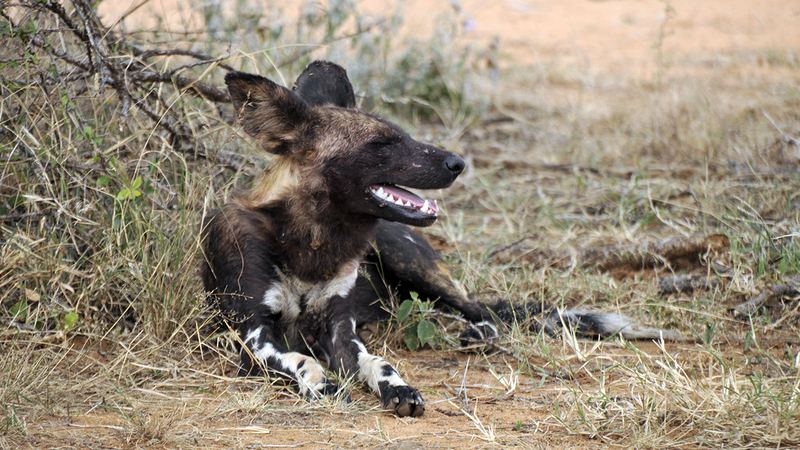 However, African wild dogs can be a threat to small livestock, such as calves, sheep, and goats, when wild prey densities are very low. 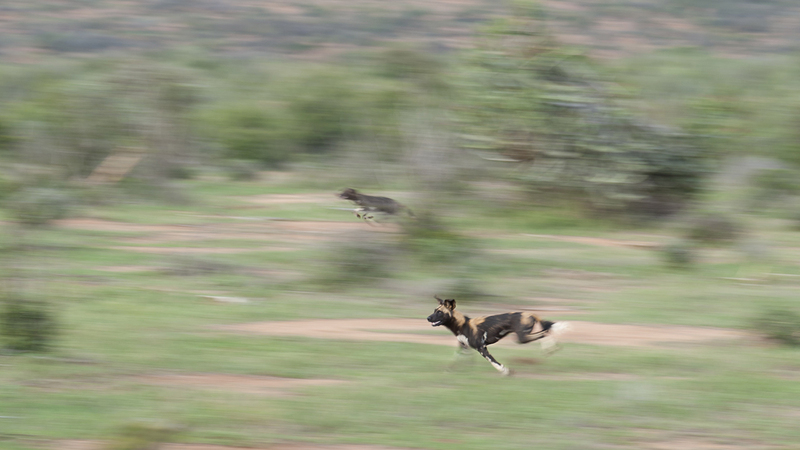 Although the largest populations of African wild dogs live in protected areas, they range beyond the boundaries and are vulnerable to high-speed vehicles, guns, snares, and poisons. The majority of African wild dogs live in eastern and southern Africa, with the largest populations in Botswana, Zimbabwe, and Namibia. Only two isolated populations remain in the western part of the continent. In central Africa, they live only in the Central African Republic and Chad. The African wild dogs in East Africa are smaller and darker than those in southern Africa, but they are the same species. African wild dogs thrive in a variety of habitats including short-grass plains, deserts, bushy savannas, woodlands, and upland forests. Packs are most numerous in thick bush and woodland habitats. African wild dogs are expert hunters. They prefer wildebeest and medium-size antelopes, including impala, greater kudu, springbok, Thomson’s gazelles. Although impalas make up the majority of their diet, what they eat depends on where they live. In Samburu and Laikipia, in Kenya, dik-diks account for 70 percent of their diet. 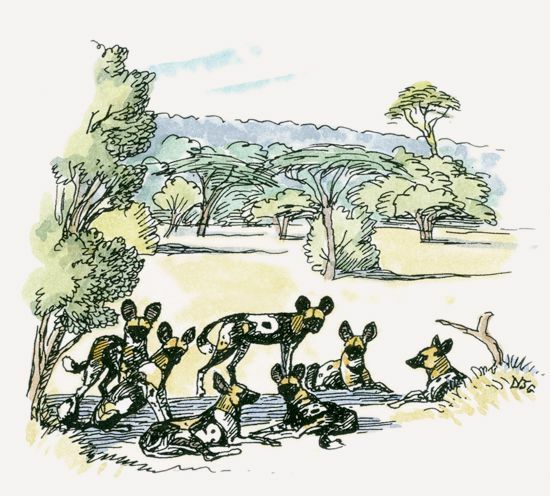 In East Africa, African wild dogs in packs of 17 to 43 eat 3.7 pounds (1.7 kg) of meat on average each day. In each pack, the dominant male and female are the reproductive pair. 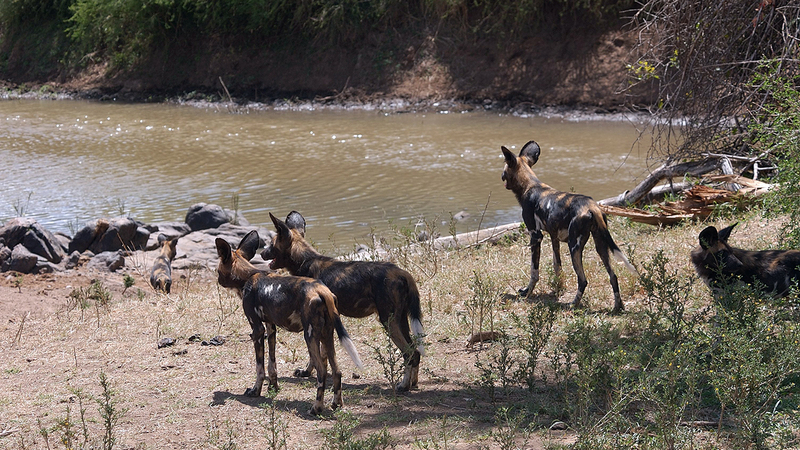 The female gives birth to between 8 and 11 pups after a gestation period of 71 to 73 days. Pups are born in an underground den, where they stay until they are 12 to 14 weeks old. 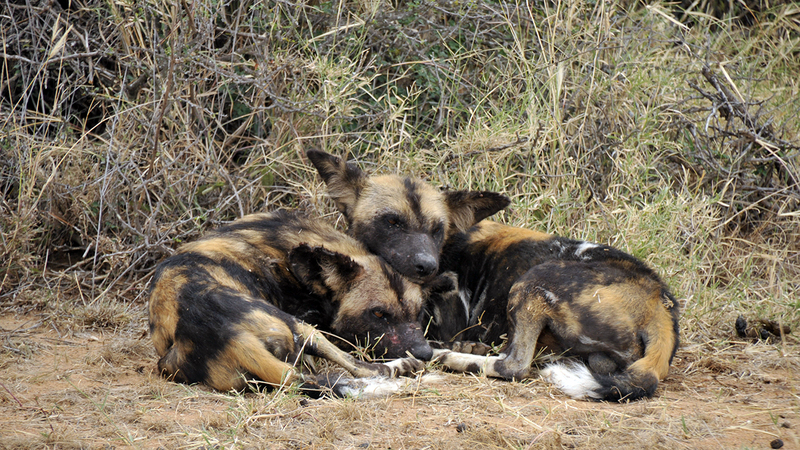 African wild dogs occasionally adopt pups that are not related to their pack. Lions and spotted hyenas are the main enemies of African wild dogs because they steal their prey. African wild dogs need to eat enough meat to recover the energy they exhaust while hunting. On average, they hunt for 3.5 hours each day to get enough food to replace energy lost chasing and killing their prey. According to one study, if other animals steal a quarter of their food, wild dogs would have to hunt an estimated 12 hours a day! 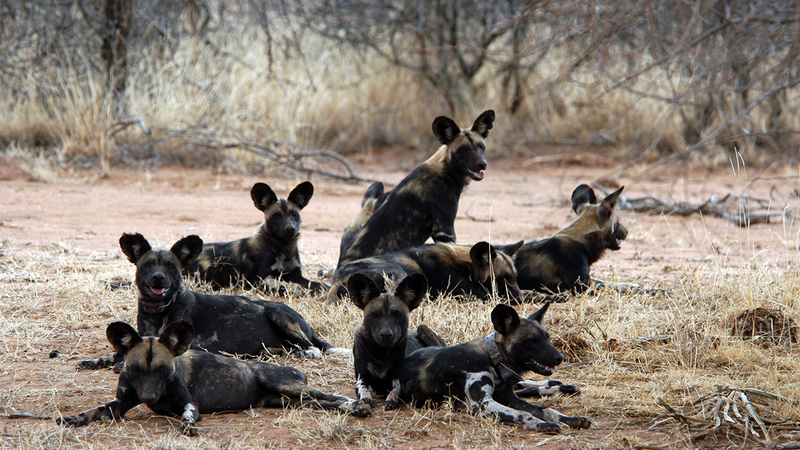 Africa is home to as many as 8,000 African wild dogs in an estimated 750 packs. The populations in Laikipia and Samburu, in Kenya, are significant, but isolated. The African wild dog is the only wild mammal to reach the 19,340-foot (5,895-m) summit of Kilimanjaro, in Tanzania.